Everyone knows he was born in the USA, but it was Bruce Springsteen's European immigrant roots — and his family's 110-year American dream — that were celebrated on Thursday. Accompanied by his proud mother and aunts — the women who "provided me with place" and "filled my family and all of my work with great meaning" — the rocker from Long Branch, New Jersey received an Ellis Island Family Heritage Award. The Statue of Liberty-Ellis Island Foundation, Inc. presents the award to immigrants or their descendants "who have made a major contribution to the American experience." Also honored were investment banker Peter G. Peterson; Avon Chairman and CEO Andrea Jung, and NBA All-Star Dikembe Mutombo. 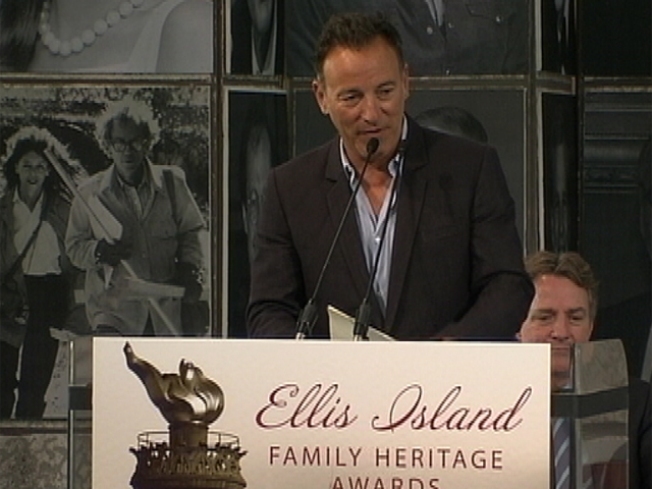 "You can't really know who you are and where you're going unless you know where you came from," Springsteen said. Springsteen's maternal great-grandmother, Raffaela Zerilli, arrived at Ellis Island from Vico Equense, Italy, on Oct. 3, 1900, with five kids in tow. "I docked at Ellis Island in a city of light and spires," their famous descendant later wrote in his song "American Land," a story not unlike their own. They joined her husband, Raffaele, in Manhattan's West Village. One of those kids, Antonio, grew up and married Adela Sorrentino. Their youngest daughter, Adele, went on to marry Irish-American Douglas Springsteen. The Springsteens raised their three kids in New Jersey. One of them was a son. When Bruce was 16, his mom borrowed money to buy him a guitar — an event he later chronicled in a tender tribute, "The Wish." He taught himself how to play it — and went on to sell more than 120 million albums worldwide — including "We Shall Overcome: The Seeger Sessions — American Land," released in 2001. The title cut, "American Land," is a raucous, gritty pantheon of immigrant pluck and pride. Adele Springsteen, now 85, who worked as a legal secretary for 47 years, went on to dance onstage with her son in New Jersey and Italy. Her son — the self-described former high school outcast — played the Super Bowl halftime show and President Barack Obama's inauguration. And on Thursday, mother, son and aunts found themselves on the island between New York and New Jersey, in the shadow of the Statue of Liberty, basking in warm applause. Adele Springsteen married into poverty and "held our family together under just great, great, great difficulty," said her son. "Thank you, Mom. I love you very much." Aunt Dora Kirby, 90, graduated with honors from college at age 67. "She's still cranking out people's income taxes," and will be available again next tax season, Springsteen said. Ida Urbellis, 87, another aunt and a longtime garment worker, still works as a hairdresser on Wednesdays and Fridays. "These fabulous women, they are my living connection to my heritage, to Ellis Island," said Springsteen. "They have personified for me the tough optimism and the work ethic of first-generation-born American citizens," he added. "They lifted my spirit. I think they put the rock and roll in me."